Your organization may be one of many that measures client satisfaction with your home care services. Elements often include contentment with the caregivers’ professionalism, work ethic or communication skills. But what about meeting expectations with meals? Time and time again I hear from companies who reveal that ‘caregivers who can’t cook’ is their MOST COMMON client complaint. While there are several ways to make a bed or remind to take medication. Preparing and serving meals that meet (or exceed) an elder’s expectations require a different level of understanding. Does the elder have special dietary needs? Are they following a reduced-sodium diet or have severe allergies to shellfish? Are there specific cultural foods they enjoy or must refrain from? When and where do they prefer to eat their meals? What are their favorite snacks? These are all questions you should be asking your clients. Does the elder have special dietary needs? Are they following a reduced-sodium diet or have a severe allergy to shellfish? Are there specific cultural foods they enjoy or must refrain from? These are all questions you should be asking your clients. And don’t forget to identify preferred foods. An elder’s favorites can bring comfort to those who are ill or depressed, bring back happy memories of dining with family or friends and encourage calories and nutrition essential to vitality and longevity. A caregiver’s ethnicity and own food culture will also influence mealtimes for your clients. If your staff members are not familiar with traditional American-style cooking, Basic Cooking Skills training will be well worth the price. 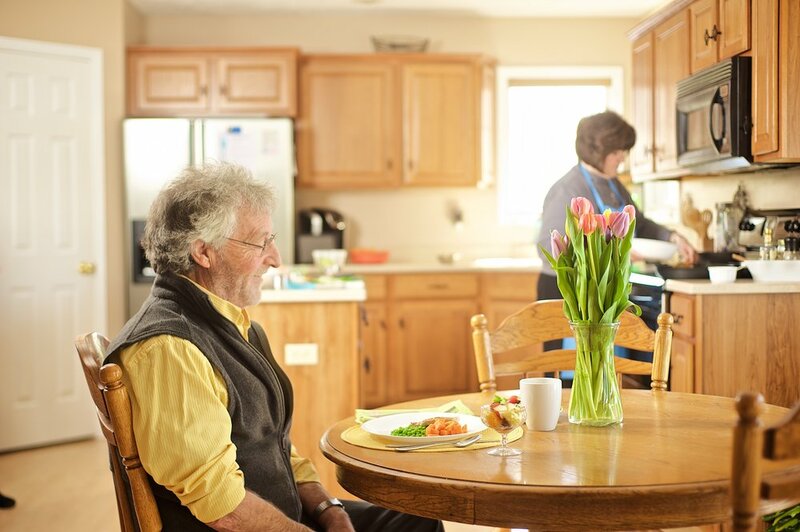 In the case of Alzheimer’s disease or other types of dementia, we know that continuing with dining traditions will often reduce confusion or behaviors that disrupt the elder from getting needed nutrition. For example, an elder who had not eaten breakfast before a dementia diagnosis may show resistance or become confused when a caregiver now insists on eating breakfast. Work with the family to recognize dining patterns and other mealtime habits. Taking time to truly understand the elder’s needs will build rapport with him and his family and increase satisfaction with the level of care. As mentioned earlier, it’s very important to include an elder’s favorite foods at meals. It’s just as important that these older adults are being offered sufficient and balanced nutrition. Review MyPlate for Older Adults to better understand food choices and servings. While it may seem best to let an older adult eat whatever they want, this practice can be very dangerous in the case of chronic illness. Excess salt or fluids can lead to emergency room visits for an elder with heart failure or food allergy reactions can result in anaphylactic shock or even death. Caregivers should be informed about which foods elders can enjoy as well as others that should be avoided. Favorite foods, enticing aromas and a colorful table will take mealtime to a new level. Serving good food will surely improve an elder’s satisfaction with mealtimes. Caregivers can go one step further by feeding all the senses. Follow these tips for using foods flavor, aroma and presentation to enhance mealtimes. The smell of food contributes greatly to its flavors, it will also stimulate the appetite. Garlic, onion or ginger add savory aromas. Also try cooking methods like roasting or braising to fill the kitchen with an inviting aroma. Food should be well-seasoned. Remind caregivers that there are many ways to flavor food without added salt. Fresh and dried herbs or spices, vinegar, citrus, mustard and honey all add different dimensions of flavor. The meal should be well presented on the plate. Add an edible garnish or use colorful dishes to draw attention to the food. Set a pretty table. This can be a simple as a colorful table cloth or interesting center piece. The idea of learning about an elder’s dining preferences may seem overwhelming when added to other required paperwork. Let me assure you, this conversation is well worth the effort. Caregivers Kitchen has prepared a simple-to-use tool to gain insights into a client’s food preferences. Download the free Meal Preferences Worksheet and complete with the help of the client or client’s family. This one-page profile can be included in the care plan and reviewed by direct care staff. Clients and their families will greatly appreciate the effort your company makes to better understand their needs and specialize their care plan. Satisfied clients will stay with you longer, tell their friends and grow your business. Knowing what the client expects is a great place to start.